I usually buy my beauty products in the drugstore, but sometimes I just can’t resist with pampering myself with some goodies from the beautyshop. 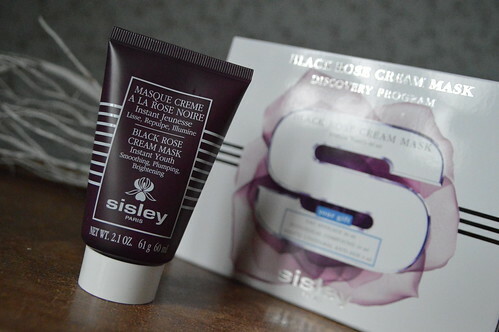 A couple of months ago, there was this promotion in my local beautyshop, so I finally bought an iconic face mask… the Sisley Black Rose Mask! Some time ago my sister recommended this mask to me and then I got a sample at my beautyshop so I could try it out for myself. I didn’t need much more convincing so when there was a promotion at my local beautyshop, I decided to buy it… but what are my thoughts now that I have tried it several weeks in a row? Read on to find out! I use this face mask once a week. I apply it with a brush (which in my opinion is the most hygienic and economical way!) and leave it on for about 15-20 minutes, sometimes even longer! Then I rinse it off with lukewarm water. The website advises to use this mask 2 or 3 times a week, but I use it once. I usually do a second facial in the midst of the week, using the L’Oréal Paris Extraordinary Oil Sleeping Cream as a night mask. I got lots of extra samples when I bought the face mask as this came in a promotion package! This mask has a lovely, soft and natural fragrance. My skin feels intensly hydrated. After applying this face mask, my skin immediately looks softer and definitely more radiant. It leaves my skin feeling very smooth. Economical in use: one tube should be fine for about 15-20 applications. When using make-up afterwards, you can still see the result of this mask. Definitely a winner!! 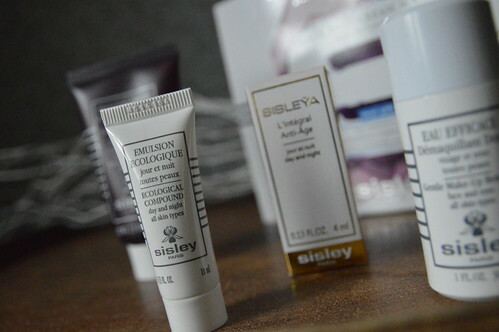 I bought this face mask during a promotion so I got all these ab fab Sisley samples for free! OK, so this face mask is pricey… (about 110 EUR for a 60 ml tube) but when you wait for a promotion like I did, you can probably buy it for about 75-80 EUR. Still pricey, I admit, but let’s make a calculation: I have used this mask 7 times now and I am not halfway through the tube yet, so let’s say that in total I will be able to use it 18 times… I paid 78 EUR, so that means that I only pay 4,3 EUR per application, which makes it very doable in my honest opinion!!! 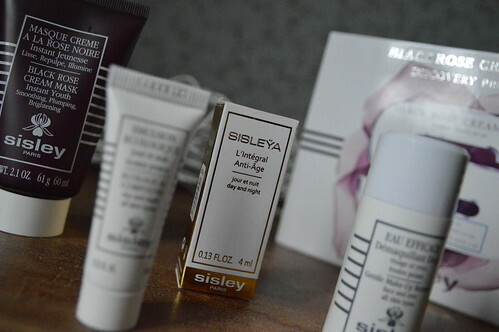 This entry was posted in Beauty, Skincare and tagged beauty, black rose mask, facial, Sisley, skincare. Funny 🙂 I will do the next sample saturday on Sisley haha I tried a bodycream. You will read it all on Saturday.